Are you a new Badger, lost in the hallways? Are you afraid of running afoul of prefects, professors, and poltergeists? Read on, my friend, and you'll learn the ways of the Sett in no time. Welcome, new Badger! Make yourself comfortable. We have a wonderful house here, and we're very happy to have you a part of it. Take a moment or three to read Prof. Felicia's welcome letter. She's got some words of wisdom and advice to share with you to help you adjust to life at HOL. Once you're registered and approved for the house forum (The Sett), I suggest you visit Huffle Orientation. 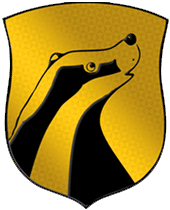 While you can find general Hufflepuff information on this website, Huffle Orientation gives you a deeper knowledge of everything that makes Hufflepuff the wonderful place it is. If you'd like some one-on-one attention, once you've gotten yourself to the Sett, why not get yourself a Badger Buddy? Badger Buddies are older students or professors who can help get you situated in Hufflepuff, show you how to get active, and answer questions. Look in the announcements section of the forum, called Hear Ye, Hear Ye, for more information. And remember, home is where the Sett is.